Are you interested in making changes in your lifestyle, learning more about sustainability issues, or volunteering your time to help grow the movement of sustainability in our campus and community? Learn about what you as a student can do to promote sustainability by exploring the pages below. What You Can Do: One of the ways students can promote sustainability on campus is by making changes in their lifestyle to reduce their ecological footprint. Whether through recycling, composting, or water conservation, this page lists just a few of the ways students can promote sustainability in their daily actions and enhance their educational experience at Truman. Who You Can Talk To: There are many opportunities available at Truman and in the Kirksville community for students to strengthen their knowledge of issues and practices in environmental sustainability. Use this page to explore the resources available to students who wish to build their knowledge of sustainability issues in our local and global community. 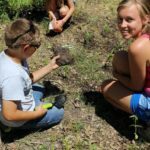 How You Can Give Back: If you are interested in giving back to your community, Truman State and the Kirksville Community offer a large number of sustainability-related internships, scholarship jobs, volunteers opportunities, and teaching positions to choose from. Use this page to search out opportunities in Northeast Missouri to give of your time and treasure.